The time to pick butternut squash, acorn squash and pumpkins is when stems have shriveled, vines are beginning to die back, and shells have hardened. If you can’t scratch a shell easily with your fingernail, it is hard enough. Cut cleanly from the vine with hand-pruners, keeping one to two inches of stem intact. Only on Hubbard-types should the stem be removed. Next, permit the squash to “cure” — that is, to heal its cuts and scratches — in warm, moist air. Ideal curing conditions are 75-85 degrees F., and 80-percent humidity. These conditions are not easily achieved during a typical Northeastern autumn. Thus, I compromise slightly, by setting my squash varieties in full sun on the wire-mesh patio table for 10 days. The produce is moved temporarily into the mud-room whenever rain or frost threatens. After curing, move the squash to cool storage. There’s no compromising here: temperatures between 50-55 degrees F., and 50-70 percent humidity are the rule. A room in my creepy Victorian cellar satisfies this storage requirement; if your cellar is too warm, too cold, or too dry, perhaps you have a slightly heated garage or an unheated spare room where the squash can be stored. Squash should never be stored on a cold, damp basement floor, nor should it be stacked. Stand the harvest on a table in one layer, or arrange it, single-file, on shelves. Stacking leads to injured produce, and this invites rot. And like the proverbial apple, one rotten squash will spoil the whole bunch. Yes, I’m dreaming of snowy evenings, roaring fires, and comforting bowls of butternut squash soup. Are you? You make winter sound so romantic! I'm dreaming of winter squash, snow, and roaring fires too. Thanks for the squash storing tips! 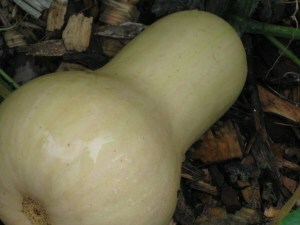 I have butternut squash in the garden, and it's almost ready. Acorn and spaghetti squash I'll buy from my CSA. Do CSAs and farms cure the squash before they sell it? Kevin, I love all of the squash you mentioned, although I've never tried hubbard. I'm going to buy a winter's supply of acorn, spaghetti and butternut squash from a local farm and try storing them on a ledge in my basement. Eric – Most farms do cure their winter squash before selling, but I'd ask to make sure. Gardenlady – Nothing like turning one's basement into a supermarket, eh? And yes, there will be recipes…I promise. I loooove butternut squash soup — but I guess I'd need a new blender for that too, huh? If you have any recipes I'm all ears! Judy – yes. Now you have TWO reasons to get a new blender (or food processor)! Perfect squash photo. I have another bumper crop. Anne – I have a bumper crop of butternut. Unfotunately, my acorns did not produce as in years past. Now that I know that squash can be stored I will try it again. Janet – LOL! Perhaps you can plant a “cool-season” harvest…arugula, broccoli, beans, spinach. These take less than 60 days to mature. Maureen – do share! Would love to have both your Veggie Casserole in a Hubbard Squash- and Spaghetti Squash Pancakes-recipes. I'll bet there are lots of Butternut Squash Soup formulae out there, too. I'll set up a blog devoted entirely to such recipes in the days to come. I grew some butternut squash for the first time this year and I have 9 small to medium squash that are almost ripe. However, something has come into my garden and taken small scratches or bites in several of the squash. They aren't deep, but I don't want them to go bad. I was wondering, do you think if I melted some wax and covered the holes, that would keep the squash fresh longer? I had hoped to keep these stored for the winter, rather than cutting them up and freezing. Terry – welcome! In general, the squash will heal its various cuts and scratches when you leave it to cure in the sun. But if the squash isn't ripe, and you are concerned about rot, you might (as you said) try sealing the blemishes with wax. Also, place netting around the squash to deter the critter (probably a chipmunk or squirrel) that is “sampling” the rind. Hope to “see” you again! My son took our squash out early this year… I have three of them… two are hard to scratch the other one has some green stripes on it and you can scratch it. I'm going to put them in the sun to cure. Can we eat the one that is not ripe or is that one just for decoration? I've heard of using it for a table decoration with candles so I am really thinking of doing that next week for my son's b-day. Oh and there are 3 or 4 still in the garden. I was told to wait until there is a frost to take them out… which might actually be this weekend… two of them I think are still green too. And then we are to cure them… so I will have to take them in at night when it frost?? Angela – welcome. I assume you are referring to butternut squash here. Don't worry about a few pale-green stripes on the skin — the flesh within is still edible. However, very green fruit should be reserved for decoration. Beware frost — it will turn your squash into mush! Harvest what you have now, and on cold nights, bring in any fruit you are curing. Do you wash dirt off the squash before curing 10 days in full sun? Paul Woodward – Nice to meet you. Do not wash the squash or get it wet in any way. Simply brush the dirt off with your hands. Hi–I live in NW TN (Zone 7A) and have been forced to harvest all of my gorgeous, plentiful butternut squashes due to intense squirrel predation. It’s either that or lose them all. Many were ready to harvest already (hard rind, dry stem that snaps off, tan color, hollow when thumped), but some were far from ready–not green but creamy white. Can I pressure can those that are not ready yet?….or should I steam and freeze them? Will they ripen on a sunny shelf? I am sick about this and have determined to NEVER plant anything out in that particular space that grows above ground because of the *^&#@!!! squirrels. (It’s behind my garage and out of eyesight so the damage is done before I know it.) I had sweet potatoes back there last summer and had a bumper crop—I need to only plant root crops….or maybe ultra-hot peppers…..that’d fix their furry hineys!!! I’m a careful canner and appreciate any insight or advice you care to pass along. Thanks!